Choosing to get an education from one of best nursing schools in Virginia is a smart way to launch a career in the lucrative health care field. As the Virginia (VA) health care industry continues to expand, the need for qualified CNAs (Certified Nurses Aides), LPNs (Licensed Practical Nurses) and RNs (Registered Nurses) also continues to grow. While nursing has always been a noble and rewarding career choice, now is the perfect time to take advantage of an industry that is desperately seeking graduates from accredited Virginia nursing schools. The ever increasing number of retirees and elderly residents has many hospitals, private practices and nursing homes scrambling to hire qualified nurses. Attending and graduating from one of the top nursing schools in Virginia will make it extremely easy to find employment directly out of school. This website is dedicated to educating potential students about the different accredited nursing schools in Virginia. Our goal is to help students choose the best career path and Virginia nursing program for their unique needs and goals. Let's face it, the best nursing school in Virginia for one person might not be the best choice for another. Before evaluating your education choices, it's important to decide on what you're educational and career goals are. Essentially, you can get started in the nursing field as a CNA, LPN, or RN. Each one of these nursing careers will require a different level of education. Becoming a Certified Nurses Aide or CNA in Virginia is by far the fastest and easiest way to get started in the Nursing profession. To become a CNA, all you need to do is attend a Nurses Aide education program that is approved by the Virginia Board of Nursing. Virginia CNA programs provide at least 120 hours of training and instruction. Upon completion, students will be able to take the NNAAP exam which stands for National Nurse Aide Assessment Program examination. After passing this exam you will be able to begin work as a CNA in Virginia. Finding nursing programs in Virginia that offer CNA training shouldn't be difficult. Many of the classes are held at community colleges, job corps centers and health care facilities in every county across the state. To learn more about CNA training get in touch with your local community college, technical school or hospital and ask them about upcoming training opportunities in your area. Becoming a Licensed Practical Nurse or LPN in Virginia requires about 12 months of education that includes both classroom and hands on instruction. Accredited nursing schools in Virginia that offer LPN training are usually vocational schools, community colleges and hospitals. After LPN training is completed the nursing student must pass the NCLEX-PN exam which stands for National Council Licensure Examination – Practical Nurse. After passing this exam you will be able to find work as an LPN in Virginia. Virginia's network of community colleges and vocational schools are great places to find LPN programs in your area. 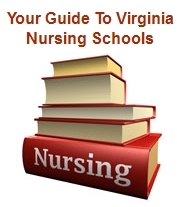 Here is a list of several good nursing schools in Virginia that offer an LPN education. It's also important to note that even if you choose to start out as an LPN you can always work your way towards an RN by continuing your education. There are several accredited nursing schools in Virginia that offer "LPN to RN" education programs for working nurses. Many of these courses can be completed while working full time as an LPN. If you desire to become a Registered Nurse or RN in Virginia than you have two different education choices. You can either pursue an associates degree in nursing (ADN) or a bachelors of science degree in nursing (BSN). Both an ADN and BSN will prepare students to take the NCLEX-RN exam which must be passed before officially earning the title of Registered Nurse. Choosing between an associate's degree and a bachelor's degree will depend on your finances and schedule. Associates programs are generally completed within 2-3 years while bachelors programs take an average of 4 years. Nursing colleges in Virginia that offer associates degrees also tend to be more cost effective than traditional 4 year universities. It should be no surprise that the higher level of education means better career and salary opportunities. This is why RN's obtaining a bachelors degree from a Virginia nursing school can expect to make more money than those who only have an associate's degree. When it comes to national recognition for quality of education, there are three nursing schools in Virginia that stand out above the rest. According to US News & World Reports, the University of Virginia, Virginia Commonwealth University and George Mason University are all ranked within the top 100 nursing schools in the nation. Depending on what type of nursing program in Virginia you decide on, it doesn't take long to rack up some hefty education expenses. However, there are many financial aid programs available to students pursuing an education. The majority of nursing schools in Virginia will have several financial aid programs to assist with tuition, fees and books. Some financial aid programs even offer assistance with living expenses while the student is attending school. Types of financial aid programs available include government grants, student loans, and scholarships (if you qualify). There are a few rules a student will have to follow in order to qualify and maintain receiving financial aid through government or private resource. Most of these qualifications include taking a minimum number of credits each semester and maintaining a certain grade point average. For example, many nursing scholarships in Virginia will assist with expenses as long as the student maintains a 3.0 average for each semester. Are Nursing Schools In Virginia Right For You? No matter what degree or certification you decide to pursue, expect to experience a combination of both textbook and hands on training. If you are new to the concept of nursing and want to get some experience in the field, Virginia has several opportunities available. Look at doing some volunteer or internship work at hospice centers, local physician offices, nursing homes or hospitals. These experiences will help you understand if you really want to pursue an education in the nursing field before spending the money to do so. If you are still interested in the nursing profession then evaluate schools with an understanding of what type of Job you want and where you want to live. Since most nursing schools in Virginia are tied in heavily with certain hospitals and medical care facilities, the nursing school you choose could play an important roll in your job placement after getting your education.